The UUSG Board of Directors and Rev. Jennifer Innis hosted a town hall on January 20 to present an update on our interim ministry process and to facilitate a forum on staffing needs for our religious education program. The event was well attended with an estimated 80 participants. As Rev. Innis explained, the standard interim period in the UUA is two years. However, special circumstances, such as a lengthy previous ministry, can be cause for a longer interim time. If a longer interim is to be considered by the Board, it would most likely be with a different interim minister, as approval from UUA Transitions Office is required to extend interim ministry contract past two years with same interim minister(s). Regarding the search process for a settled minister, the steps recommended by the UUA span approximately 18 months. For instance, if UUSG desires to call a settled minister in August 2020, preparations ought to begin in the next 1-3 months. The time required to prepare for and conduct a successful search stems from the entire congregation’s part in selecting the next minister. It takes significant time, thought, and care to help a community move toward a 90% (or higher) majority vote. The UUSG Board believes that paid RE staff is needed to fulfill our mission. Comprehensive Lifespan RE, providing program leadership for religious education across all age groups. After a question-and-answer session, a poll of attendees was conducted to measure which type(s) of staffing are most supported. 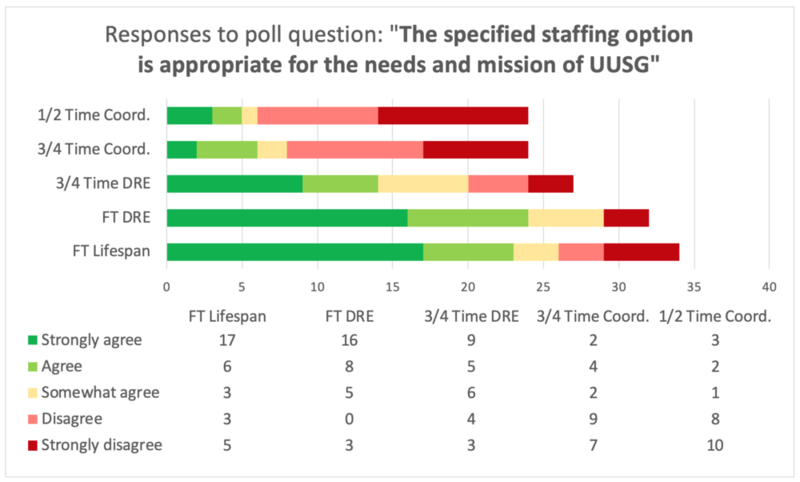 Two questions were asked via paper ballot: 1) Which staffing option(s) are most appropriate for the needs and mission of UUSG? and 2) Which staffing options would people be willing and able to support through increased pledging? Attendees were asked to submit one form per pledging household. Forty-two responses were submitted, representing an estimated 20% of annual pledges to UUSG. 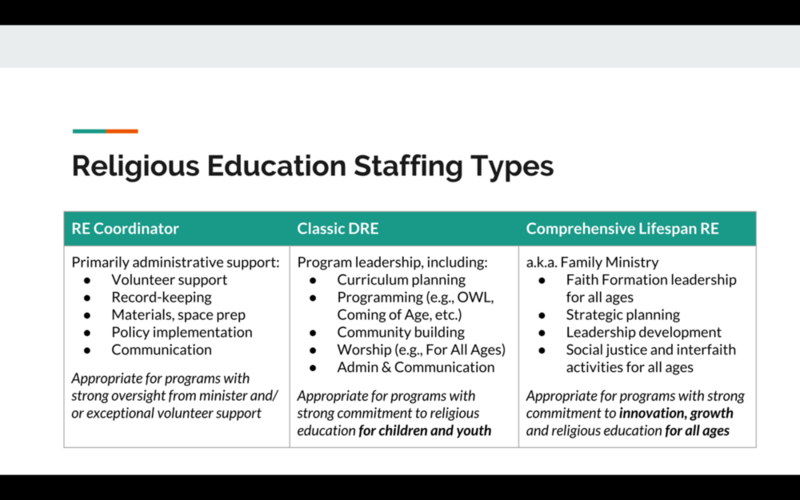 Tabulated responses are depicted below (see Figures 3 and 4) and reveal the strongest support for hiring a full-time Director of Religious Education. Results also suggest support for a ¾-time DRE. There is keen interest among many respondents for Comprehensive Lifespan Education but relatively less financial support for that option. Finally, there was relatively little support for both the ½-time and ¾-time RE Coordinator options. Next steps are for the Board of Directors, the interim ministers, and other lay leaders to discuss these findings and begin planning for a coordinated stewardship campaign to support a hiring plan. In the meantime, if you have questions or comments, please contact UUSG President David de Coriolis or Revs. Patrick and Jennifer.